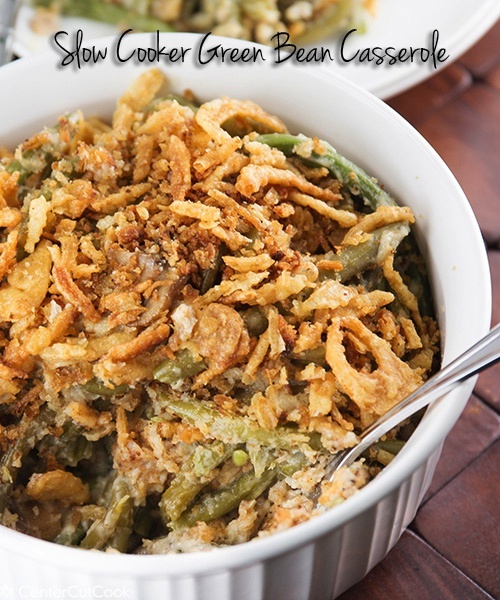 Slow Cooker Green Bean Casserole made from scratch with fresh or frozen beans, a homemade cream sauce (no cream soup! ), cheese, and topped with French’s French Fried Onions. 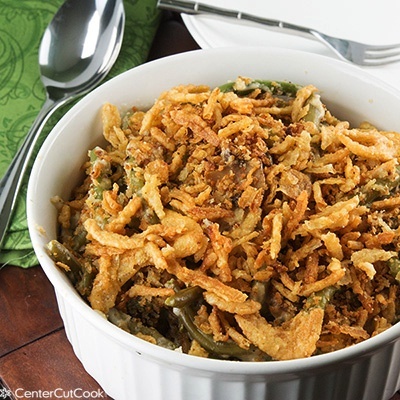 This is the best Green Bean Casserole! 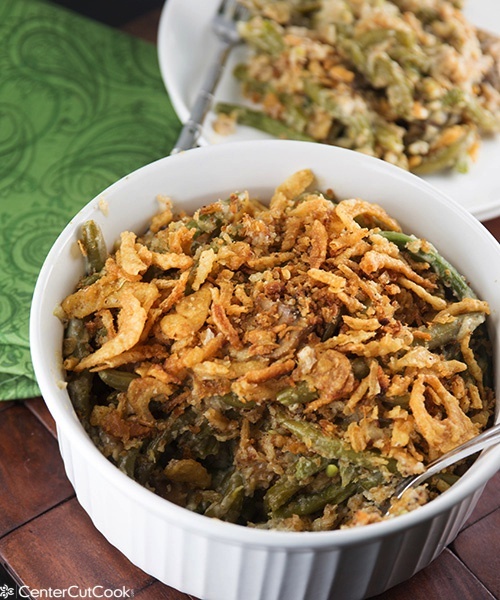 Green Bean Casserole is one of those classic, almost iconic recipes that is typically made as part of a traditional Thanksgiving spread in many homes across America. I grew up eating the version made with Campbell’s Condensed mushroom soup with French’s French Fried Onions, as I’m sure many of you did. As a kid, I could have been completely happy eating an entire plate full of green bean casserole and my Mom’s homemade rolls for Thanksgiving dinner! I’ve always loved it. Despite the fact that the canned soup version is well-known and easy to make, I wanted to share a version of the green bean casserole with you that didn’t involve canned cream soup — an updated, more modern recipe of sorts. As I was developing my own recipe, I got inspiration from a couple of different sources. I really liked the idea Cook’s Country had to use fresh mushrooms and to cook the Green Bean Casserole in the slow cooker. Crock Pot recipes are so convenient, especially for hectic holiday meals! Ree, The Pioneer Woman had a great idea to incorporate cheese, and bacon into the casserole and both Ree and Alton Brown used panko bread crumbs for the crunchy topping instead of French’s French Fried Onions. Taking all of these ideas into consideration, I came up with my own version that I have made with both fresh green beans and frozen beans. It’s made in the crock pot, from scratch with a homemade cream sauce (I used my Cream Soup Substitute recipe), fresh mushrooms, and a little parmesan cheese. While I loved the idea of using panko bread crumbs, I wasn’t entirely ready to ditch French’s French Fried Onions altogether, so I decided to use a combination of panko bread crumbs with the french fried onions. The result of this slow cooker recipe is one of the best green bean casseroles I have ever had! If you are serving this for Thanksgiving dinner, you can prep the sauce ahead of time so that you can quickly assemble the casserole and cook it in the crock pot on the day that you will need it. And as I mentioned, you can use fresh or frozen green beans, the only difference will be that you’ll need to adjust the cook time a bit. 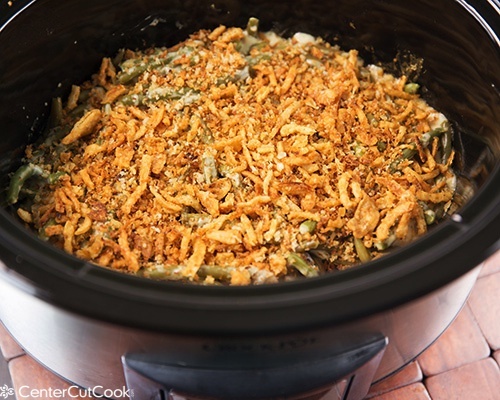 With Thanksgiving right around the corner, I invite you to try my version of classic Green Bean Casserole, without cream soup and made in the slow cooker for extra convenience! You’ll get 8-10+ servings from one batch. Enjoy! In a large saucepan, melt 4 tablespoons unsalted butter over low heat. Whisk in 6 tablespoons flour and let cook for 1-2 minutes. Slowly stir in 1 cup chicken broth, then 1 cup milk. Whisk until it begins to thicken. Let it simmer for a few minutes. Season to taste with a bit of salt and pepper. Stir in 1/2 cup half and half, then set aside. In a non-stick skillet, sauté 8 ounces fresh mushrooms slowly so that they release all of their moisture. Season them with 1/2 teaspoon salt, 1/2 teaspoon black pepper, and 1/2 teaspoon ground thyme. When the mushrooms start to turn golden brown (after about 10 minutes), add them to the sauce from step 1. Stir in 1 cup finely grated parmesan cheese. In a large bowl, toss either fresh or frozen green beans with the mushroom sauce. Spray a slow cooker with non-stick cooking spray. Pour the green bean mixture into the slow cooker and sprinkle 1/2 cup French’s French Fried Onions over the top. Shortly before serving, heat 1 tablespoon butter in a non-stick skillet over medium heat. Add in 1/2 cup panko bread crumbs and cook until lightly toasted. Add in 1 cup French Fried Onions and cook for a minute longer. 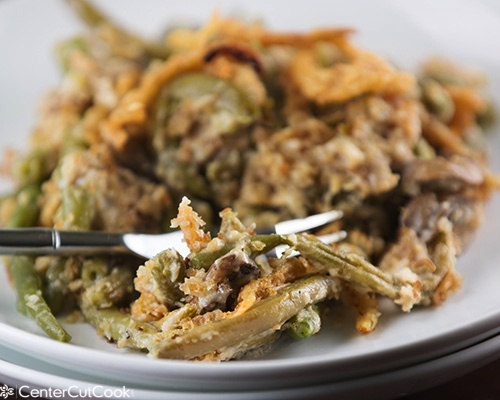 When the green bean casserole is done cooking, transfer it to a serving dish. Sprinkle the french fried onion/panko bread crumb mixture over the top and serve.